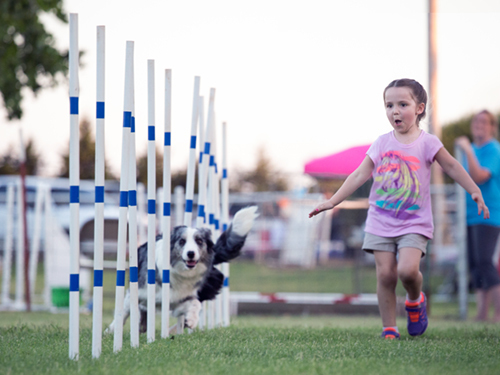 The BCSA Juniors Program, which is open to all Border Collie junior handlers, is committed to supporting, educating and encouraging junior handlers because we feel they are the future of the dog fancy. Since this is a new Program, we have a long way to go and would love to have your input on what we can do to better this program and/or what you would like to see included in this program. This page will keep you up-to-date on the program. We spotlight our Junior stars at the National Specialty with special recognition during our “Social” and also include their photo and profile in the Specialty catalog. We would like all Border Collie Junior Handlers to contact us so that we can recognize you, too. We would like to hear all about you and introduce you to the rest of the world. We celebrate your love for the breed and would like to encourage you to remain active well into your adulthood. If you are a junior member or your a member of your family is a BCSA member, please contact Kasie McGee with any questions or your ideas for the program. If you would like to become a member, visit our Membership page. We look forward to hearing from you! The scholarship will be available to all high school seniors. In addition, current college students who were junior handlers can still apply. Applicants will be able to apply for the scholarship each year of their undergraduate and graduate college career. The junior must be a current BCSA member or must have previously been a member. The applicant has to have competed in any venue with their Border Collie for a minimum of one year. The applicant must have a minimum of a 2.0 grade point average to apply. It is open to applicants pursuing all majors in college. The Application: The application consists of five parts. Basic information of the applicant including involvement with their Border Collie. Essay. This will be a 500 to 750 essay on a provided prompt. Community service and other activities applicant participates in. Two letters of recommendation; one from someone such as a teacher and the other from someone in the dog/trial field in which they compete. Applicant’s official transcript from the current school year. The Judges: The applications will be judged by five to seven members of the Board and members on the Juniors Committee combined. Anyone related to or is a close friend of an applicant will not be permitted to judge. For those using the eApplication below, the letters of recommendation can be e-mailed by each person writing a letter directly to the BCSA Corresponding Secretary, Terri Clingerman, 4980 Brick Schoolhouse Rd., North Rose, NY 14516. Notification of the Winner: The applicant who earns the scholarship will be notified on May 31 via letter. Disbursement of the Scholarship Money: The money will be disbursed directly to the applicant. Once the winner is notified, proof of school enrollment must be sent to the corresponding secretary before the scholarship will be mailed. The check will be mailed within three weeks after receiving the proof or enrollment. If the BCSA does not receive the proof by October 1st, the scholarship will become null and void. How has your involvement in Border Collies influenced and positively affected your life? Submit 500-750 words on a separate sheet. Be sure to include your name on your essay and mail to BCSA Corresponding Secretary, Kathy Sours, 3821 W. Charter Oak Rd, Peoria, IL 61615 or e-mail to Corresponding Secretary (file size not to exceed 1MB).